In the article by Penn and colleagues (2008) mentioned above, it is argued that it is our evolved capacity for relational, role- and rule-governed analogical thought that fundamentally transforms human cognition (see also Deacon 1997: 435-438). Apart from this proposal and the idea that consciousness might be the rubicon separating humans and animals, there are, of course, countless other proposals for what it is that makes humans unique. These include, for example, language (Bickerton 2009), symbolic thought (Deacon 1997), unique social cognitive capacities and motivations (Carpenter 2011), the capacity for mental time travel and autobiographic memory (Suddendorf & Corballis 2007) or conscious, higher-order, domain-general intelligence (Evans 2003) (see also these posts, i, ii, iii, iv). As these examples amply demonstrate, the debate on human uniqueness and animal consciousness are hot and controversial topics in the philosophy of mind and cognitive science more generally. One seemingly insurmountable problem that immediately arises is of course what we mean by the term ‘consciousness’ in the first place (e.g. Blackmore 2010: 8ff. ; Burkhardt & Bekoff 2009: 40f.). However, it is widely acknowledged that there are at least some behavioural and physical criteria that can be taken as indicators for at least some form of consciousness (Blackmore 2010: 208f.). 3. Metacognition of others’ mental states” (Gómez 2009: 45). In this posts I will deal with mirror self-recognition. I’ll discuss the other two in my next post. These capacities are most often mentioned in discussions of the mentality of primates, especially great apes, but there are also relevant results from other ‘clever’ species outside the primate lineage such as, for example, dolphins (e.g. 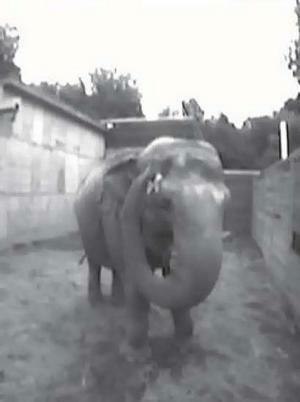 Herman 2009), ravens, and elephants (Blackmore 2010: 208ff.). When they are about 18 months of age, children begin to recognize themselves in the mirror. This is tested by applying a spot of rouge somewhere the child cannot see it by herself, e.g. her forehead, without the child noticing. 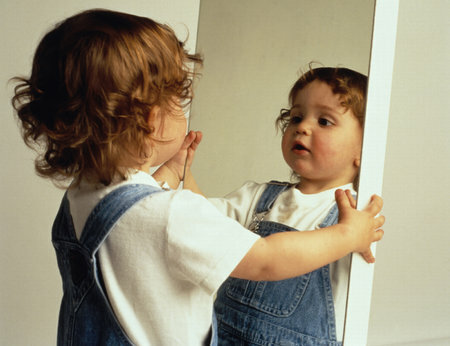 By about 18 months of age, children begin to notice and touch the spot on their forehead when they stand in front of a mirror. Around the same age, children also start using personal pronouns to refer to themselves, such as ‘me’, ‘mine’, and ‘I.’ Together with some other indicative behaviours at this age this has been taken as evidence for the emergence of a concept of self and of consciousness of one’s own self around that age (Lewis 2005: 363). 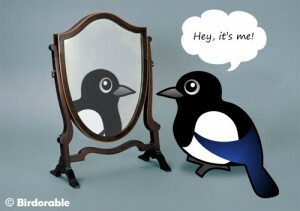 Similar methods have demonstrated mirror self-recognition (MSR) in a number of other species, including the great apes (chimpanzees, bonobos, orangutans, gorillas), but also elephants, dolphins and magpies (Blackmore 2010: 210-214). Although there were also some claims that some monkey species (e.g. macaques and cotton-top tamarins) could recognize themselves in a mirror, these results could either not be replicated or were flawed methodologically (Anderson & Gallup 2011). If we take MSR to be evidence for a concept of self, self-awareness, and consciousness, than this would mean that the species mentioned above who pass this test have some form of consciousness. However, there is a lively debate revolving around this contentious issue and it is possible that MSR only requires some form of complex body-concept. This means that MSR might not imply self-consciousness but just the ability to represent “body schemas, rather than cognitive schemas: i.e., awareness of oneself as a physical entity rather than awareness of oneself as a psychological entity” (Gómez 2009: 46). The results of the following experiment do indeed suggest that MSR is not equivalent to conscious self-awareness: In a scenario similar to that of MSR, three- and five-year old children were filmed while playing with an experimenter, in the course of which the experimenter surreptitiously attached a sticker to the child’s forehead. When the children were shown a video of what just happened immediately afterwards, only the five-year-olds touched their foreheads when they saw what happened in the video. Three-year-olds, on the other hand, seemed not to be able to integrate information about their past self into a coherent, conscious present self and did not realize that the sticker was still on their forehead (Gopnik 2009:146). 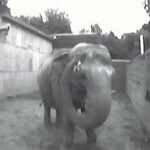 Consequently, it is not clear whether animals passing the MSR test possess this important aspect of self-awareness, i.e. whether they are capable of perceiving themselves as a continuous, conscious entity, and have an autobiographic memory (Burkhard & Bekoff 2009: 40f. ; Suddendorf & Corballis 2007). 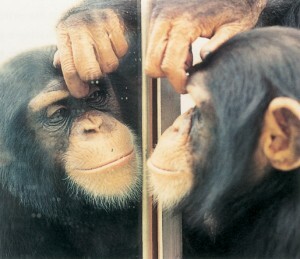 Anderson, James R. and Gordon G. Gallup, Jr. (2011) “Which Primates Recognize Themselves in Mirrors?” In: PLoS Biol 9(3): e1001024. Herman, Louis M. (2009): “Animal Consciousness: Dolphins.” In: Tim Bayne, Axel Cleeremans and Patrick Wilken (eds. ): The Oxford Companion to Consciousness.Oxford:OxfordUniversity Press, 43-45. Bickerton, Derek (2009): Adam’s Tongue: How Humans Made Language. How Language Made Humans.New York: Hill and Wang. Burkhardt, Gordon M. and Marc Bekoff (2009): “Animal Consciousness.” In: Tim Bayne, Axel Cleeremans and Patrick Wilken (eds. ): The Oxford Companion to Consciousness.Oxford:OxfordUniversity Press, 39-43. Carpenter, Malinda (2011): “Social Cognition and Social Motivation in Infancy.” In: Usha Goswami (ed. ): The Wiley-Blackwell Handbook of Childhood Cognitive Development. 2nd Edition. Malden, MA [et al. ]: Blackwell, 106-128. Deacon, Terrence William (1997): The Symbolic Species. The Co-evolution of Language and the Brain. New York / London: W.W. Norton. Evans, Jonathan St B. T. (2003): “In Two Minds: Dual-Process Accounts of Reasoning.” In: Trends in Cognitive Sciences 7(10): 454-459. 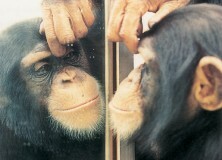 Gómez, Juan-Carlos (2009): “Animal Consciousness: Great Apes.” In: Tim Bayne, Axel Cleeremans and Patrick Wilken (eds. ): The Oxford Companion to Consciousness. Oxford:OxfordUniversity Press, 45-48. Gopnik, Alison (2010): The Philosophical Baby: What Children’s Minds Tell Us About Truth, Love and the Meaning of Life.London: Bodley Head. Lewis, Michael (2005): “Selfhood.” In: Brian Hopkins (ed. ): The Cambridge Encyclopedia of´Child Development. Cambridge: Cambridge University Press, 361-365. Penn, Derek C, Keith J. Holyoak and Daniel J. Povinelli (2008): “Darwin’s Mistake: Explaining the Discontinuity between Human and Nonhuman Minds.” In: Behavioral and Brain Sciences 31.2: 109-130. Suddendorf, Thomas and Michael C. Corballis (2007): “The Evolution of Foresight: What is Mental Time Travel, and is it Unique to Humans?” In: Behavioral and Brain Sciences 30.3, 219-313.